Cheer | Wherever you go, there you are. This is a post from last year when I was laden with humbuggedness. Scrooge, actually moved over! But then I discovered the movie “Becoming Santa” and my spirit was renewed. and the weather, to my mind, is frightful — rainy, gray, almost balmy. So it’s time to watch my new favorite Christmas movie again…tonight! As I sat down to try to write a jolly Christmas post yesterday, there was a huge swath of snow and blustery weather swooping across the middle of the country and up into Canada. That stretch of North America has looked a lot like Christmas for several weeks already. Here? Well, I had the windows open and my fa lala was more off key than ever. But, within the hour daugher Carolynn and husband Bill arrived from the little village in upstate New York where we’d lived for seventeen years, me ever glorying in the deep, cold, snowy white winters, husband Peter, not so much. We’d all just watched a wonderful Christmas movie. 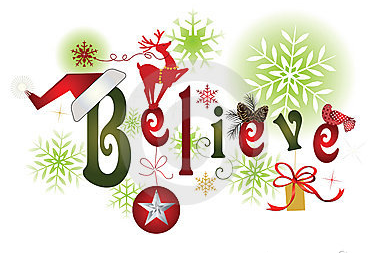 Believe me when I say it’s better than any version of Dicken’s “Christmas carol,” “It’s a wonderful life,” “Love, actually,” “Christmas Story,” “Rudolph the red-nosed reindeer” or any other holiday movie you can name. 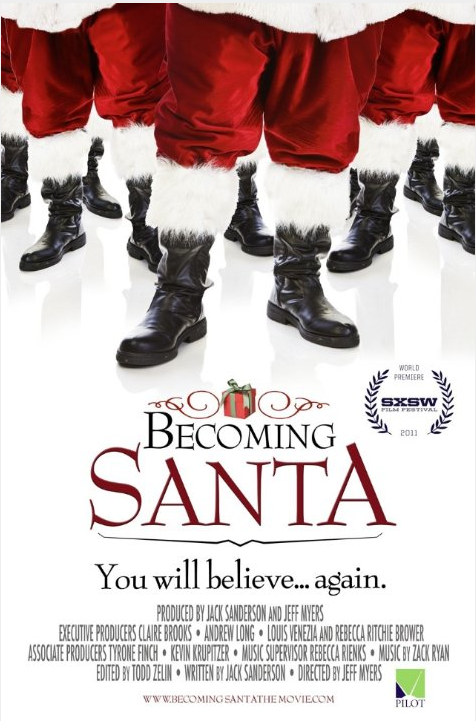 “Becoming Santa” (2011), is destined to become a classic, mark my words. I found it buried deep in the “Documentary” heading on Netflix, but a quick search on-line showed that it’s available on iTunes and Amazon as well. Treat yourself, stop what you’re doing, watch it now! Writer/actor/star, Jack Sanderson, is a young man — mid-forties is young to me — who lost his Christmas spirit after his mother died a few years ago. She was an enthusiastic Christmas-lover, so her death, followed not long after by his father’s passing, threw Jack into a tailspin. Then, he was inspired by a photo he’d never seen of his father playing Santa for neighborhood children. He decides to become a Santa too, to give back, in other words. He has his hair and beard professionally bleached and styled, gets fitted for a suit and goes to Santa school, a film crew in tow to record the experience. This movie has everything — laughs, sweet tears, adorable children, inspiration, dedication, hope. What “Becoming Santa” does not have is violence, mayhem, war or foul language, I could’ve watched it right through again, it was that good. Jack seems determined to become Santa, but occasionally he expresses doubts. He goes to Santa school to learn the basics — always say “children” instead of “kids,” for instance, and always “Ho, ho, ho,” never just one “ho” nor more than three. You wonder as he wanders, musing, reflecting. Will he last, or won’t he? There’s a lot more to the film than Jack’s own quest — Santa experts, historians, professional Santas weigh in as well. Two common threads tie it into a beautiful package: a genuine love for children and an understanding of how important Santa is to them. The “sneak and peak” segment near the end is tear-inducing, but in a good way. This morning I’m revitalized, imbued with spirit and holiday glee. All I need now is seasonal — make that North Pole-like — weather. Carolynn hadn’t packed a snowball in the large cooler Bill lugged inside yesterday, but it was filled with all-important special ham and Polish sausages. She did bring a big carton containing dozens of special cookies, and the astounding surprise of homemade peppermint marshmallows her friend Robin sent along for us.